August 27, 2014 - As airlines across the globe scramble to determine the appropriateness in the use of the Knee Defender by passengers, Qantas and Virgin Australia airlines have made it clear, in released statements both carriers have indicated that the use of such a device is banned on their aircraft. Knee Defender is a device that passengers can purchase online, it is used to lock and prevent the passenger in front of you from reclining the seat back and hitting your knee. The seller of the product states on their website that “It helps you defend the space you need when confronted by a faceless, determined seat recliner who doesn't care how long your legs are or about anything else that might be back there". On Sunday, United Airlines Flight 1462 from Newark to Denver was forced to make an emergency landing after two passengers got into a flight over the Knee Defender. A male passenger who was doing some work on his laptop had installed the device on at the base of his tray table. The women in front of him complained that she was not able to reline her seat, they began to argue and it is alleged that she threw water on the man. The pilot made an emergency landing, both passengers were arrested. Virgin Australia stated "The use of Knee Defenders or similar device would be in breach of our conditions of carriage. The safety and comfort of our guests remains our highest priority." 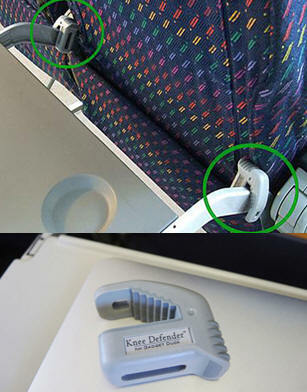 Qantas stated it will not "permit attachments such as the Knee Defender to aircraft seats."